02:05:00 Makes 4 servings, 1 dessert cup (111 g) each. Makes 4 servings, 1 dessert cup (111 g) each. 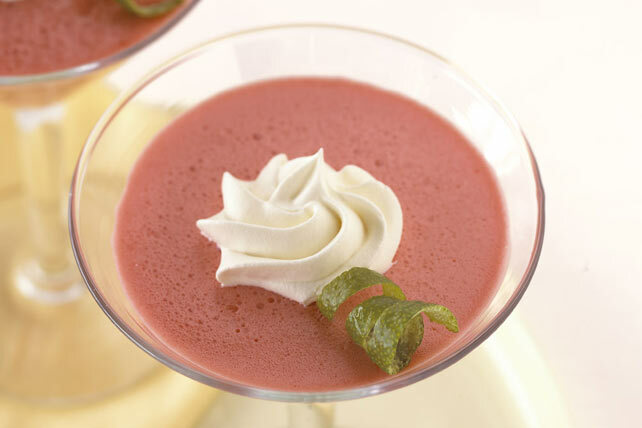 A fun easy dessert with the look and flavour of your favourite cocktail. Add boiling water to jelly powder in medium bowl; stir 2 min. until completely dissolved. Stir in sorbet until melted. Pour into 4 martini or wine glasses. Refrigerate 2 hours or until firm. Top each with 1 Tbsp. Cool Whip just before serving. Top each dessert with a lemon or lime twist. Prepare using 2 cups boiling water, 2 pkg. (85 g each) JELL-O Strawberry Jelly Powder and 2 cups orange sorbet. Pour into 8 glasses. Makes 8 servings. Serving Size Makes 4 servings, 1 dessert cup (111 g) each.